Important note: I live — and bake — at high altitude (6,035 feet). If you live below 5,000 feet, you may get better results with these brownies by lowering the temp to 350 degrees and increasing the bake time 5 minutes or so. optional stir-ins or toppings: chocolate chips, M&Ms, nuts, frosting, etc. Preheat oven to 375 degrees. Coat 9 X 13 baking dish with cooking spray. In mixing bowl, combine dry ingredients (first five ingredients). Add all the wet ingredients (all remaining ingredients minus the stir-ins/toppings) and stir, stir, stir by hand until well mixed but not overly smooth. Batter will be super thick. If opting for stir-ins, this is where you stir them in. Pour into prepared pan, spreading the thick batter throughout using the back of the mixing spoon. If adding toppings, add them now. Bake 17-20 minutes or until a toothpick inserted comes out slightly sticky. Cool 10 minutes then cut into squares. Another option: These are flatter brownies but if you prefer the super thick sort, use a 9 X 9 baking dish and increase baking time 5-10 minutes, checking with a toothpick after 5. Will make fewer (but thicker) treats. 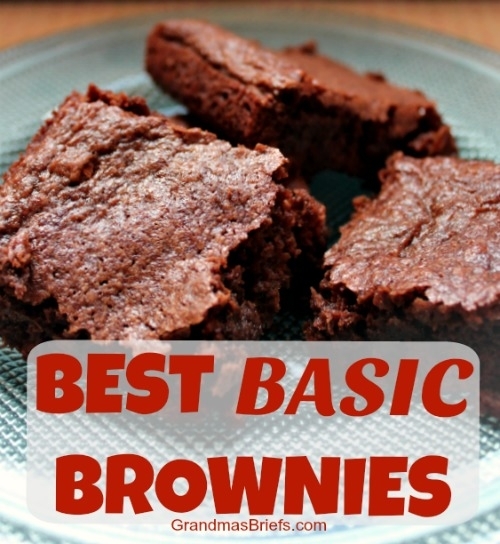 Another brownie: I do have a super rich, super sweet, not-so-basic brownie recipe, too. Right here.